Story: The spine-tingling sensation of deja vu has mystified humankind for centuries. The feeling hits at the strangest moments - when we fall instantly and madly in love with a total stranger, when we arrive at a brand new place we know like the back of our hand, whenever events occur that inexplicably feel like they have must have played out somehow, somewhere before in our lives. From philosophers to filmmakers, we have all wondered: Where does this feeling come from? Is it all in the mind or does it emerge from some deeper reality? Why does it happen? And most of all, what does it mean? Everyone has experienced the unsettling mystery of deja vu - that flash of memory when you meet someone new you feel you've known all your life or recognize a place even though you've never been there before. But what if these strange, spooky feelings were actually warnings sent from the past or clues to an unfolding future? 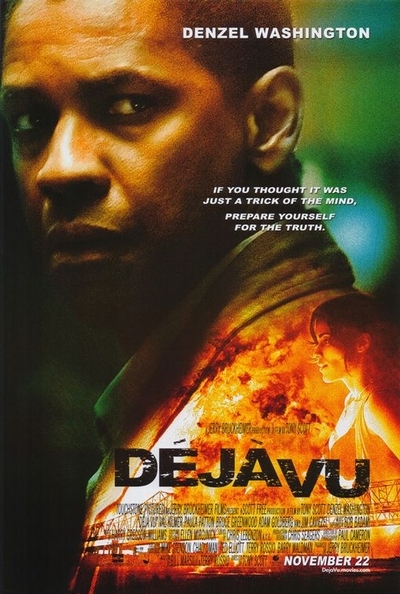 In the captivating new action-thriller from producer Jerry Bruckheimer and director Tony Scott, written by Bill Marsilii & Terry Rossio, it is deja vu that unexpectedly guides ATF agent Doug Carlin (DENZEL WASHINGTON) through an investigation into a shattering crime. Called in to recover evidence after a bomb sets off a cataclysmic explosion on a New Orleans Ferry, Carlin is about to discover that what most people believe is only in their heads is actually something far more powerful - and will lead him on a mind-bending race to save hundreds of innocent people. As Carlin's investigation deepens, it not only probes through the very fabric of space and time, but becomes an innovative love story that unfolds in reverse, when Carlin discovers his puzzling emotional connection to a woman whose past holds the key to stopping a catastrophe that could destroy their future. In the split second of a glance, without words yet with complete trust, Carlin takes one chance to change everything.